Today we finally get to test the house properly on the river for a week. 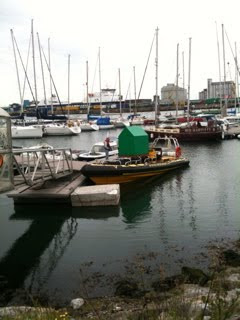 We drive it down to Ringsend yacht club and with the aid of Jimmy Murray and his son we haul the house on to one of his boats. 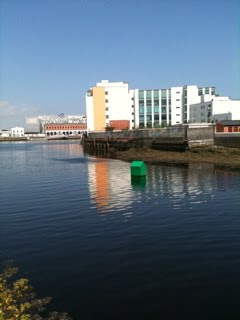 We zoom up the river before hanging a left opposite the new O2 arena and enter the river Dodder. Here, where the two rivers meet we moor the house, dropping from each corner ropes attached to concrete blocks anchors. It floats beautifully, the anchors work and the house barely drifts. This video show Ger Clancy and Jimmy Murray's crew mooring the house for the first time. The house is left in place until Sunday night, I cycle down every day to check on it. It works perfectly, I'm almost disappointed there's not more drama. 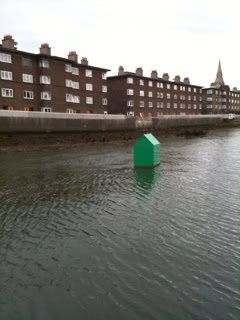 Here's a video of the house in the ebb tide where we expected it to tilt and be more unstable. liffeytown is fantastic, I came upton it by mistake and couldnt believe my eyes! Well done, a great idea.